Founded in 2005, Starbuzz Premium Flavored Tobacco is one of the most prominent names in modern hookah tobacco - love it or hate it, everyone knows who Starbuzz is. They focus on unique flavor combinations that are smooth and sweet and have plenty of juice to produce those fluffy clouds we all find ourselves chasing. With a medium cut that is both dyed and undyed depending on the flavor, they have an extensive variety to choose from so no matter your preference, Starbuzz has something to satisfy your craving. Starbuzz has a huge variety to choose from and their 250 gram jars allow for Hookah users to smoke several times a month or with large groups of friends. This size is packaged in individual tins with a secondary sealed packaging inside. This package is resealable but prone to rust so make sure to store it at room temperature in an airtight container so that it is sure to maintain its freshness. 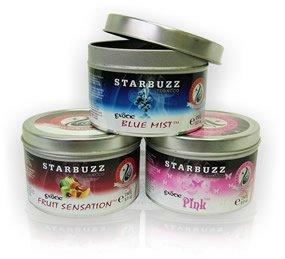 Starbuzz is super juicy and produces the best results when using a semi-fluff pack to the rim in a phunnel bowl. Always mix up your tobacco to redistribute the juices and then sprinkle it in producing a fluff pack. Just use your thumb and index to lightly drop in the tobacco up to the rim of the hookah bowl but not over. It can be fairly heat sensitive so it is recommended to start with 2 hookah coals before working up to adding more heat; this will ensure you do not burn your tobacco and prematurely end your session early. 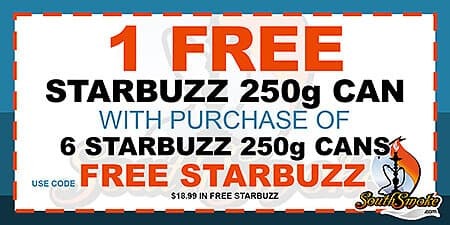 For more details regarding the Free Starbuzz Tobacco 250g Promotion, please click here. 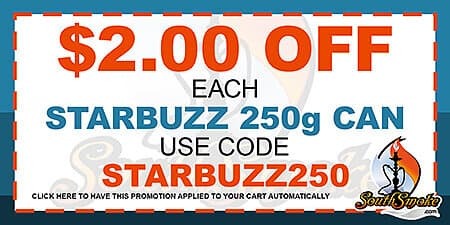 For more details regarding the Starbuzz Tobacco 250g Promotion, please click here.